Confession time: I’m a sucker for CEDIA PR. The amazing electronics, beautiful speakers, and slick home automation systems are tantalizing but honestly, usually intended for a difference audience. Something is different this year though, because here I am posting two CEDIA announcements in as many days. This time we have an announcement from Cambridge Audio highlighting a new line of “Aero” speakers. 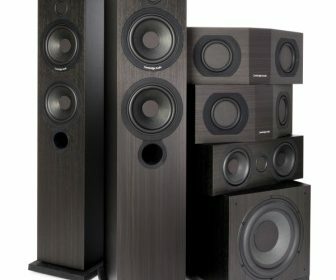 Besides the normal (read good) spec’s three things stood out for me: price (not bad, especially considering intended audience), the innovative “dual monopole” design of the surround speakers enabling a 7.1 setup in roughly the same install footprint of 5.1, and that they really chose the wrong color to highlight (click through to the website to see the walnut finish). Of course the PR does nothing to prove how good a speaker sounds so if anyone has a chance to listen to the Aero let us know what you think. We’ve combined radical technology and classic styling to produce a completely new type of speaker design. After years of research into BMR (Balanced Mode Radiator) technology, our engineers recognised how amazing it could be in a more traditional speaker design. The innovative Aero range is the result: BMR drivers replace traditional tweeters and work beautifully with conventional cone woofers to create fantastically clear, natural and coherent audio. We’ve built them into classic speaker cabinets that will look good anywhere. And because BMR speakers aren’t fussy about placement, they can be positioned almost anywhere in the room and still sound great. Radical, yet classic – the Cambridge Audio Aero range is here. Remove your preconceptions of what speakers sound like, and listen for yourself.